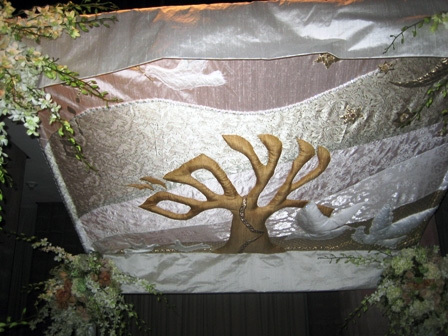 Customarily at Temple B’nai Abraham the aufruf ceremony is held on the Shabbat before the wedding, when those to be wed are called to the Torah for an aliyah. To arrange for an aufruf ceremony, please contact Clergy Assistant Debbie Meron at 973.994.2290, ext 211. If you wish to sponsor a Kiddush, please contact Communications Coordinator Tina Greenberg at 973.994.2290, ext 217. Jewish tradition teaches that the celebration of a wedding is to be filled with happiness, love and joy. The Temple B’nai Abraham family shares in your excitement of this important family milestone, which you will remember and cherish for years to come. To be married at Temple both participants must be of the Jewish faith. The TBA Sisterhood has created a beautiful handmade Chuppah (see photo on the right) that you are most welcome to rent for your simcha. See below for fee schedule. Please contact the temple office for details. For information regarding the temple’s wedding guidelines, please contact Clergy Assistant Debbie Meron at 973.994.2290, ext 211. If you wish facility information, please contact Communications Coordinator Tina Greenberg at 973.994.2290, ext 217.